OVER $150,000 IN CUSTOM UPGRADES! 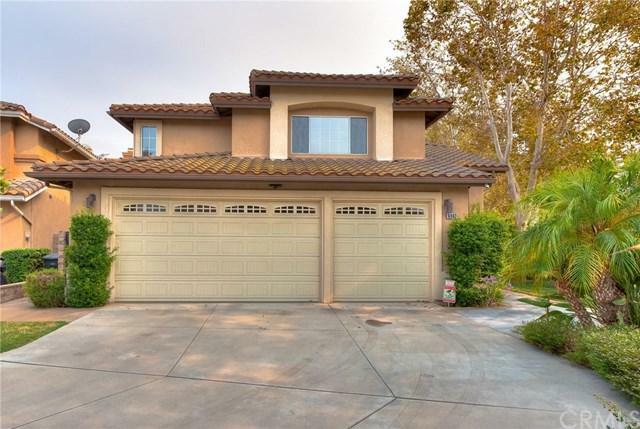 Located in a highly desired cul de sac neighborhood in Hunters Hill, Chino Hills, this beautiful home is an entertainer's dream! Upon entering, you will appreciate the high ceilings, open floor plan and upgrades throughout. The top of the line gourmet kitchen features granite counter tops, custom cabinets, mosaic tile backsplash, professional grade Viking appliances and built in refrigerator. It is also has an open flow onto the family room, centered around the warm fireplace and built in media cabinet, perfect for relaxing. 1st floor features a bedroom, full beautifully remodeled bath and laundry room. Going up the custom wrought iron staircase, the second level features a beautifully remodeled master suite with spacious walk-in closet and dual sink vanity, large soaking tub and large walk-in shower, all beautifully upgraded with granite and custom tile work. The second level also has 3 additional bedrooms, 2 full baths PLUS Bonus Loft area. Spend relaxing days in the rear yard with a sparkling pebble tec pool & spa with new heater and pump, covered patio and built in BBQ all surrounded by lush tropical foliage. Additional amenities include upgraded AC units and an alarm and 8 camera video security system with remote monitoring and Ring doorbell for peace of mind. Come make this your dream home! Sold by Sandra Gilbert of First Team Real Estate.